I first stumbled onto Keiko Futatsuya’s work two years ago while searching for botanically-dyed sashiko thread. She was working with Hida Sashiko at the time, but has since moved on to produce her own work as an independent artist and designer. The quality of her work is amazing, and has developed over time to reflect her passion and joy in handwork. Keiko’s boundless energy knocked me off my feet when I visited her earlier this year. She is in constant motion, darting from idea to to idea, rarely sitting still. While we sat in her tiny kitchen one afternoon she frequently jumped up to retrieve items tucked away in dressers, or hidden in old boxes in the back of a closet. We wandered through her house, discussing sashiko history, techniques, fabric choices, and sashiko’s future. Maybe “wandered” is too casual a word; there may have been some sprinting involved for me to keep up with her at times. Did I mention she doesn’t speak much English, and I barely speak any Japanese? Her son Atsushi ran interference for us over the phone, translating back and forth while Keiko and I had a wild day throwing ideas back and forth like volleyballs. Here is an interview with Keiko from earlier this year, translated by Atsushi. 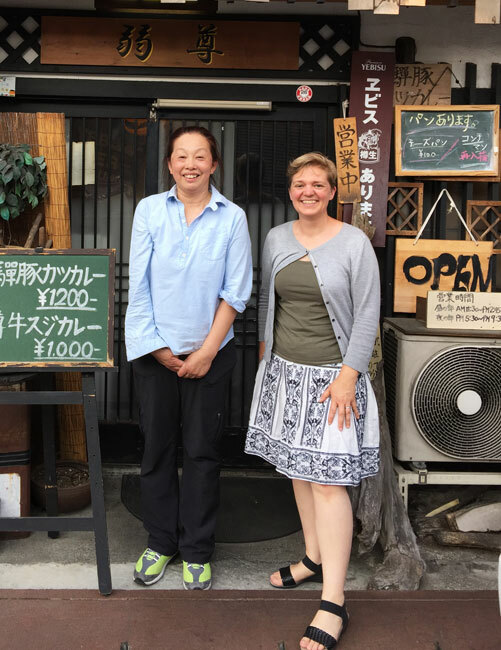 I am grateful to them both for their kindness and generosity, and their drive to share sashiko with the world. Notice the running shoes and only one rolled up sleeve? This is a woman who lives in perpetual motion! She’s also an artist who hates posing for photographs. I can relate. When did you start practicing Sashiko? I started practicing Sashiko when I got married into a family which operates a Sashiko business (Hida Sashiko). About 10 years ago I started creating Sashiko products as a designer and producer. I didn’t have the authority and/or responsibility to create Sashiko art pieces when I got married. Since I wanted to try to make some Sashiko art pieces by and for myself, I used defective fabric (dirty or worn out) to enjoy making small Sashiko pieces so I didn’t need to spend much on expenses and to avoid conflict with management. I believe this experience lead me to Sashi.Co’s mission, “Appreciate Fabric”. Throughout working for the family business (Hida Sashiko) I learned a lot from “Sashiko Practitioners” who stayed at their houses and actually did Sashiko for the business. What tools or materials do you prefer? The materials and supplies we (as Sashi.Co) introduce are what I am proud of. I am using a needle, a thimble, a skein of thread, and fabrics which Sashi.Co introduce. What is your personal style: relaxed, precise, improvisational, formal? I practice Sashiko as “work/business”. 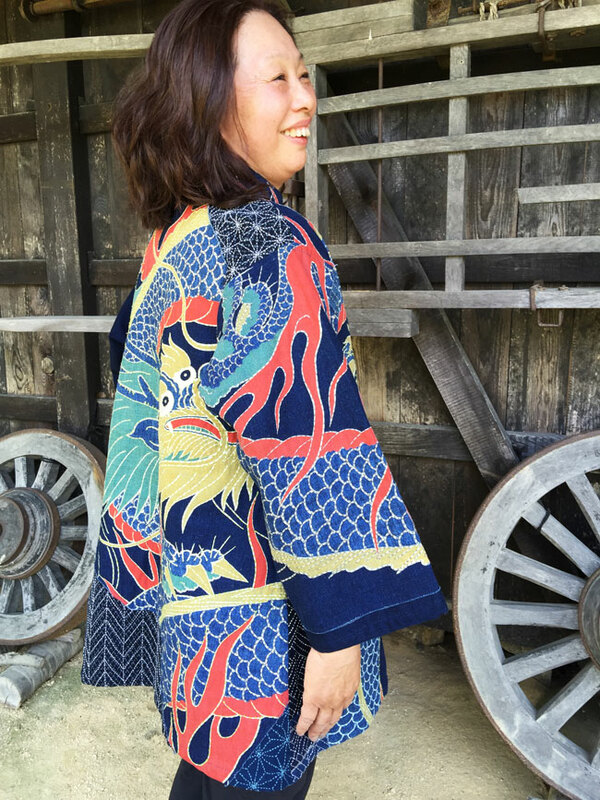 I try my best to create Sashiko products to meet my customers’ needs and satisfaction. I hope that our products can impress people with love for Sashiko. It is also very important to have a project that excites and entertains myself. What do you enjoy most about Sashiko? What would you like others to know? I enjoy meeting people who love Sashiko. I enjoy the opportunities Sashiko provides for me. I would like to share how enjoyable it is to have Sashiko in one’s life. It is so enjoyable to bring old worn-out fabric back to the “main stage” by strengthening and redesigning old fabric. 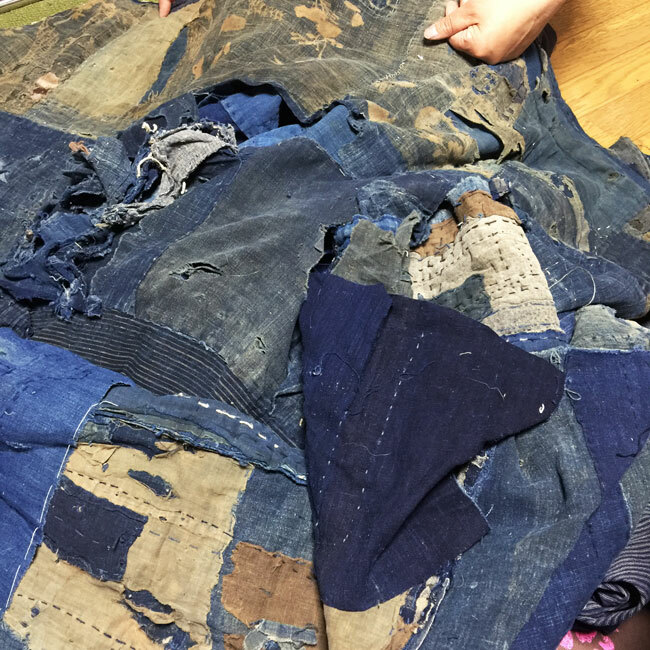 These old fabrics would just go to a trash bin if Sashiko wasn’t practiced, but by doing Sashiko, it can be the most beautiful cloth in the world. Introducing this beautiful world is my dream as well. What has Sashiko taught you about life? I learned “If one keeps trying to continue without giving up, even a small step forward, the result will come true.” Sashiko art is the result of small hand-stitches. Sashiko taught me how important it is to have passion, and to continue following it. Also, I learned how enjoyable it is to have friends and partners around in collaborating projects to create art pieces. Life is all about connecting to other people, I believe. How do you feel about non-Japanese people learning Sashiko? I am happy about that. It is wonderful that non-Japanese people are learning Sashiko. Do you think Sashiko is difficult to learn? Sashiko is not difficult at all. Even big stitches, or not-straight stitches, they are all good. Every stitch is as unique as the stitcher. These unique stitches make Sashiko pieces interesting and beautiful. I am proud of my Sashiko style (when I teach) that anyone can enjoy Sashiko in their own way. Of course, a good amount of time and effort is necessary when it comes to having the ideal stitches on fabric for certain Sashiko projects. Not the ideal for someone else, but the ideal for yourself and your project. Do you do other crafts? I dye threads and fabric with natural vegetable dyes in order to have my ideal color on thread and fabric. 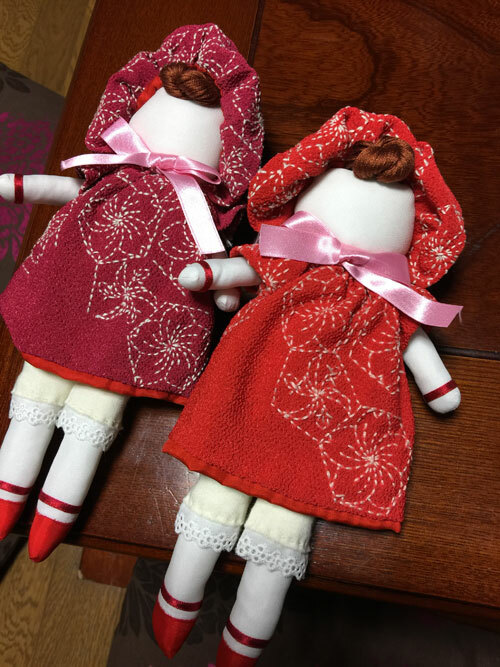 Also, I sometimes make traditional Japanese “Culture-Doll (Bunka-Ningyo)”. Tell us about your favorite project. Otsuchi Sashiko Project in Iwate Prefecture. Since the project was established in 2011 after the earthquake in Northeast Japan, my son Atsushi and I have been collaborating with and supporting the project. They have created many Sashiko pieces. What would you suggest for someone new to sashiko? Needles, a thimble, and threads on the Sashi.Co website are my recommendation. Indigo dyed fabric and old fabric (kofu) with kasuri patterns are always great. The pieces shown above (except for the dolls) are available in my shop, Kimonomomo. Click on the photos to view them in more detail. Thanks Carole, nice article and I enjoy learning about your trip the the people you met. I’ve loved reading your posts about Japan. Did Keiko teach you about the history of sashiko? I’m so interested in it’s cultural roots. Very interesting…I love sashiko so much! I recently was able to purchase many skeins of Hida thread directly from a store in Japan for a bit more than $4 each…what a thrill to get my package and find all that lovely thread inside! I love the Hida thread…so much better than Olympus.